This month, the CDC released the preliminary results of the National Health Interview Survey for 2017. The great news is that the percentage of American adults who smoke dropped nearly 2 percentage points from last year, from 15.8% to 13.9%. This is the lowest number in more than 50 years. But in Ohio, the percentage of people who smoke did not change; in fact, it is going up. Smoking has notable demographics. Men are more likely to smoke than women (15.8% versus 12.2%). White Americans are more likely to smoke (15.7%) than Black Americans (15.1%) or Hispanic Americans (9.7%). People living in a rural area are more likely to smoke (21.5%) than people living in small cities (15.6%) or large cities (11.4%). On January 11, 1964, Dr. Luther Terry, the Surgeon General of the United States, released a report concluding that smoking causes lung cancer and chronic bronchitis. That year, 42% of Americans smoked and the average per capital U.S. cigarette consumption was 4,300 per year (another way of stating this is the average American smoked 215 packs of cigarettes per year). The number of cigarettes smoked immediately began to fall. The science behind this report was solid but there were a lot of “smoking-deniers” who refused to believe it and so in the mid 1970’s, the per capita cigarette consumption in the U.S. rose. 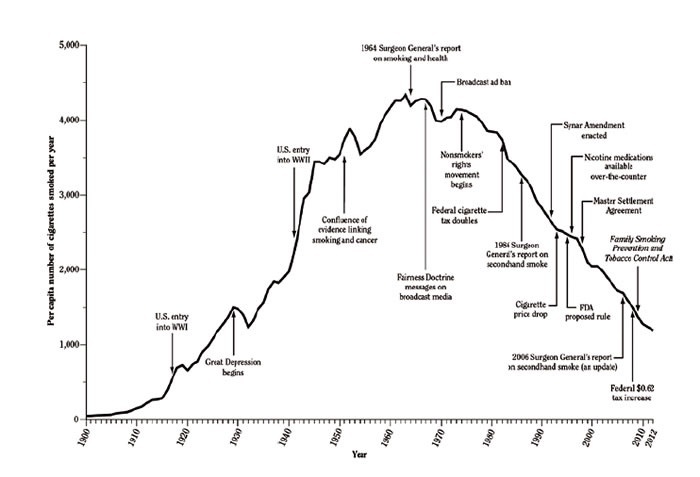 Over time, most of the deniers either changed their mind or died so that now, 54 years later, only a few Americans doubt the relationship and the per capita cigarette consumption has been steadily falling every since the mid-1970’s. 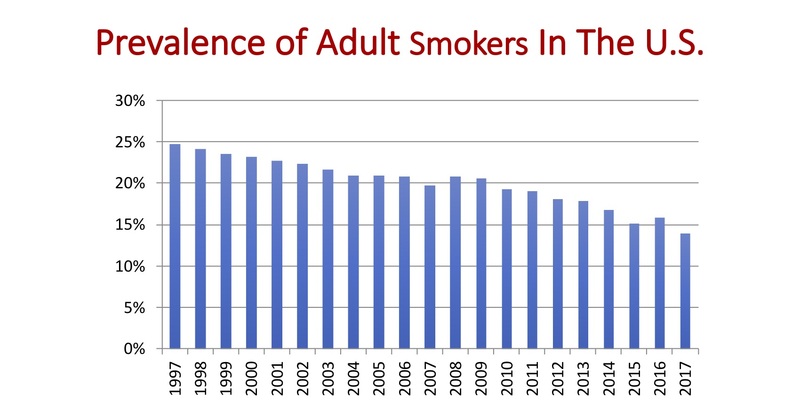 Over the past 20 years, the percentage of Americans who smoke has fallen an average of 0.5% per year. At that rate, in 26 years, no Americans will smoke. Therefore, in 26 years, three jobs that you don’t want to have are: tobacco farmer, cigarette maker, and pulmonologist. Alas, my medical specialty is going to go the way of the blacksmith, slide rule maker, and telephone operator. From a health economics standpoint, cigarettes are actually a very effective way of government cost-control. The average woman who smokes a pack a day will live 11 years less than a non-smoking woman and the average man who smokes lives 12 years less than a non-smoker. If you do the math, it works out to losing 14 minutes of life for every cigarette a person smokes. 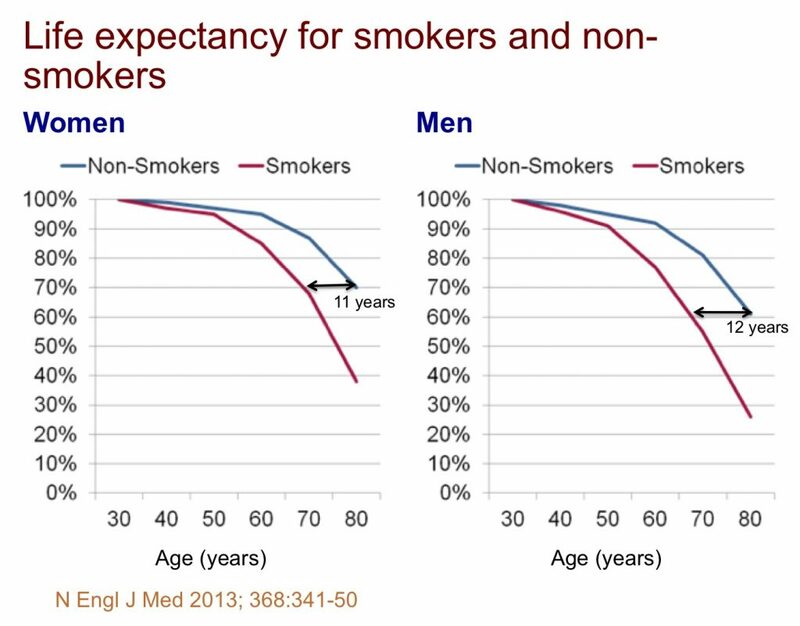 Since smokers die so much earlier than non-smokers, they consume a lot less Social Security benefits. With more Americans not smoking, we’ll see more people living long enough to be on Medicare and Social Security. Age. 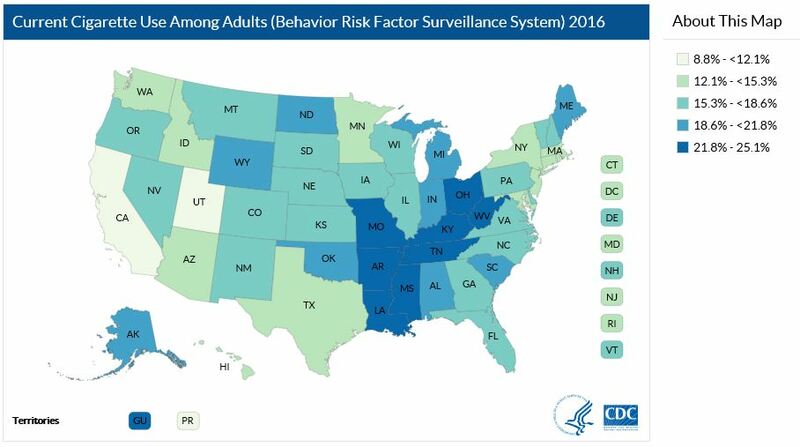 Similar to the rest of the country, the older you are in Ohio, the less likely you are to smoke. However, young Ohioans (age 18 – 44) are far more likely to smoke (26.4%) than in the rest of the country (18.1%). Race. Nationwide, Hispanic Americans are the least likely racial/ethnic group to smoke but 22.3% of Hispanic Ohioans smoke, double the national average. Ohio has the dubious distinction of being one of the most equal opportunity states for smokers with about the same percentage of white, black, and hispanic Ohioans smoking. Education. For many years, there has been a significant inverse relationship between education and the prevalence of smoking – the more education a person has, the less likely they are to smoke. But in Ohio, for those people with less than a college degree, these differences are amplified. 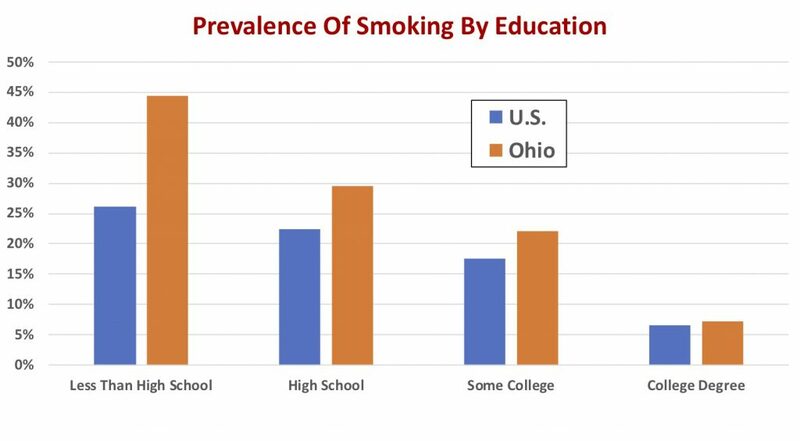 Thus, if a person doesn’t finish high school in Ohio, that person is far more likely to smoke than a high school dropout in the rest of the country. Income. Not surprisingly, the relationship of smoking with income tracks that of education. But once again, in Ohio, the effects of income are amplified. Rural versus urban. Nationwide, Americans living in rural areas are less likely to smoke than those in large cities. But Ohio is different. 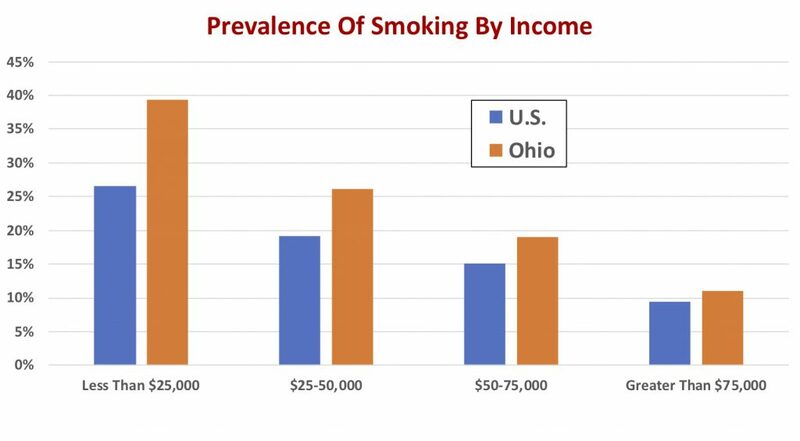 People living in Ohio’s large cities have the same prevalence of cigarette smoking as those who live in rural Ohio. As a pulmonologist, this unfortunately means that I will still have a job in Ohio when I am well into my 80’s, long after my peer pulmonologists in the rest of the country are out of work.